Why Does Your Baby Cry?! If you are first time parents, it is often difficult to guess why your baby is crying! 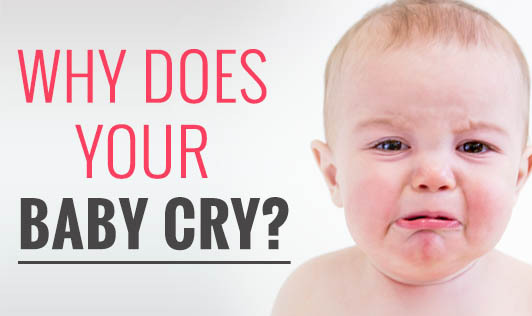 Here are few common reasons that might help you figure out possible reasons for your baby's cries. • Hungry: This is one of the primary reasons that your baby would cry for. Star tracking the time of your baby's feed, as this will help you recognize why the baby is crying and feed it before it starts getting fussy. • Dirty Diaper: Some babies cannot tolerate a dirty diaper and want it to be changed right away. • Want to sleep: Babies create a fuss and cry when they are tired and want to sleep. Instead of just dozing off, they cry as most of them find it hard to fall asleep. • Wants to be held and cuddled: Babies love to see their parents, hear their voices and get cuddled by them. Babies identify their parents from their unique smell. • Tummy troubles: Tummy troubles are mysterious to identify. If your baby cries often after feeding, it can be due to gas, indigestion or constipation. • Need to burp: If your baby cries after feeding, a good burp can soothe him down. Some babies swallow air while they are breast fed or while drinking from bottles. Air in the stomach can be bothersome for the babies. A burp is all they need to calm down. • Too cold or too hot: Babies are very sensitive to cold. They generally prefer to be warm, but not too warm. So, if your child is wearing an extra layer of clothes, it could be too hot for them. • Other Factors: Small things like uncomfortable clothing, socks, insect bites, a sudden loud noise, and darkness, light that is too bright, or the position they are held in could make them cry. • Not feeling well: If you have comforted your baby with the basic needs and most of the above causes are ruled out, you should be alert for any symptoms of illness. If your baby's cry doesn't sound right, then go with your instincts and see the doctor.